A good way to test your design under worst-case conditions is to capture a known good waveform on a scope, download it into an arbitrary waveform generator (arb) and then modify various signal parameters to emulate worst-case input conditions. In the past this required a scope and an arb remotely connected to a PC that was running custom software or some instrument specific software package. That has all changed with the features found in modern arbs and scopes. Now all you need is an arb, a scope, and a usb memory device. In this blog post we will run through an example of capturing and storing 10 bytes of a known good RS232/UART transmit serial bus signal using an Agilent 3000 X-Series scope. We will then transfer the stored waveform data into an Agilent 33522A function/arbitrary waveform generator for replay without touching a PC. We will then look at some example features found on modern arb’s to modify our serial bus signal to test a design under worst-case input conditions. I am using a serial bus signal for example purposes only. You can apply the techniques here to easily and quickly test for worst-case conditions using virtually any kind of analog or digital signals. The scope’s timebase is set to 1.000 ms/div to capture 10 bytes of 19.2 kbps RS232/UART serial bus traffic, as shown in the figure below. After “windowing” on the portion of the waveform we want to capture, we save it as an “ASCII XY data (.csv)” to our USB memory device. The captured waveform was decimated down to 10K points. The saved waveform data can now be imported into various software packages including Microsoft® Excel spreadsheets, MATLAB, and numerous other waveform processing/editing applications. But most importantly, we can import this waveform data directly to our modern arb, which in this example is a 33522A. To import the saved waveform into the arb, we just need to move our USB memory device from the scope’s front panel USB port to the arb’s front panel USB port. From there a simple push button sequence on the arb’s front panel imports the CSV data and recreates the waveform in memory. The stored waveform consisted of 10,000 points that covered a time-span of 10 ms; this provided an effective/decimated oscilloscope sample rate of 1 MSa/s. The arb will take the time data from the CSV file and automatically set the sample rate of the arb to match it (in this example 1 MSa/s). Now that we’ve reproduced the original “golden” waveform, we can easily modify it in order to test for worst-case input conditions. Let’s assume that you know that your receiver responds correctly to the signal conditions of the “golden” waveform running at 19.2 kbps and with normal signal amplitudes and minimum noise. But what if you wanted to test your system running at a much faster baud rate (1.3824 Mbps) and perhaps with additional noise? Let’s first change the baud rate of this RS232/UART signal to 1.3824 Mbps. Remember that the original baud rate was 19.2 kbps. Since 1.3824 Mbps is 72 times faster than 19.2 kbps, we should change the arb’s sample rate to 72.0 MSa/s (1 MSa/s x 72). We can add random noise to the signal using the arb’s modulation features. Additive noise can be created using the Sum modulation feature, while noise in the form of jitter can be created using the PM modulation feature. To perform more advanced waveform editing of the signal some modern arb’s like the 33522A have built-in Waveform Editor. These waveform editors typically can be used to modify individual points on the arb or modify the arb using built-in and custom math functions. The figure below shows an example of the modified test signal now running at 1.3824 Mbps with additive random noise. As you can see, the scope is showing multiple decoding errors under these modified worst-case input signal conditions. 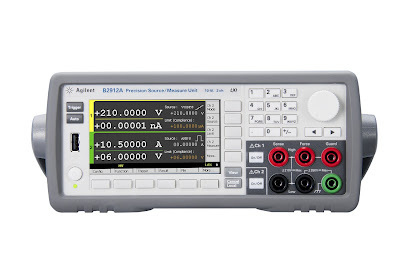 The Agilent B2900A Series of Precision Source/Measure Units are compact and cost-effective bench-top Source/Measure Units (SMUs) with the capability to output and measure both voltage and current. An SMU combines the capabilities of a current source, a voltage source, a current meter and a voltage meter along with the capability to switch easily between these various functions into a single instrument. 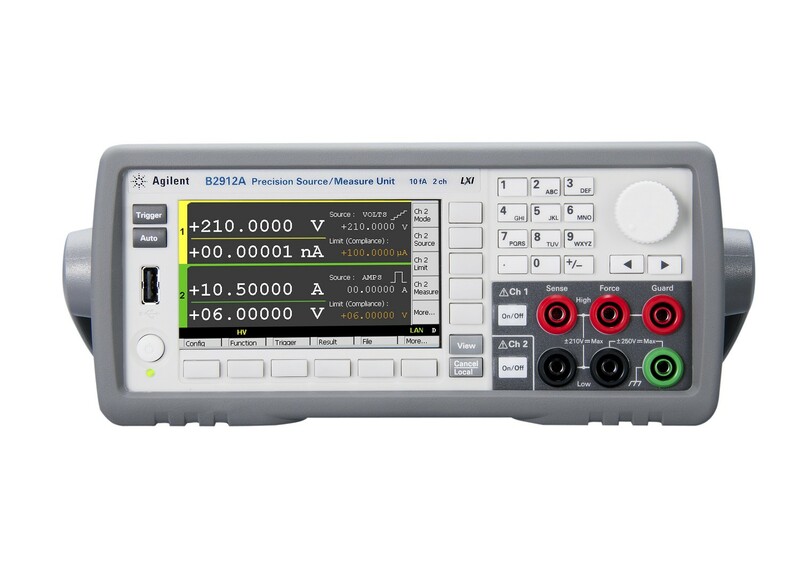 The Agilent B2900A series of SMUs provide best-in-class performance at a lower price than ever before. They have broad voltage (210 V) and current (3 ADC and 10.5 A pulsed) sourcing capability, excellent precision (minimum 10 fA/100 nV sourcing and measuring resolution ) and high measurement throughput. They also support an arbitrary waveform generation function. Here is quick 5 min video that a colleague of mine made that does a great job of explaining what the Common Mode DMM spec is, for both DC and AC. Recently I created a Matlab program for making Allan deviation measurements using Agilent's 53230A universal counter called "Stability Analyzer 53230A." The program performs true Allan Deviation measurements using the 53230A's gap-free sampling capability. The program provides an "All Tau Analysis" plot of the Allan deviation calculations. The Allan deviation calculations made are based on an array of Tau values you as the user provide. A second plot is also done of the measurement data that features time on the x axis and frequency on the y axis. All of the measurements and Allan deviation calculations can be accessed from the Matlab's command line after the program runs for further analysis. It is a great easy to use program for doing general frequency stability measurements on oscillator, clocks, and amplifiers. The program uses LAN to connect and control the 53230A. All you need is the 53230A's IP address to connect. The program requires Matlab's Instrument Control Toolbox package to be installed. You can make the measurements on any of the 53230A's channels including channel 3, the optional microwave channel. This give you the ability to make stability measurements all the way up to 15 GHz. The "Stability Analyzer 53230A" program is free to download from Matlab Central (link below). In the downloaded program folder there is a Word document with operating instructions. Below are two plots from an example run of Stability Analyzer 53230A (double click to enlarge). 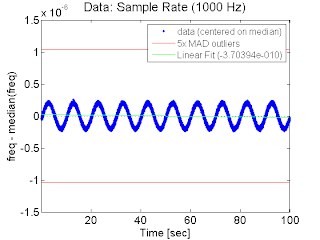 The example signal used was a 10 MHz signal with 0.1 Hz of frequency modulation added to simulate a cyclic disturbance such as temperature cycling. We can easily deduce the frequency of the cyclic noise in either plot. In the Allan deviation this is clear because we see dips at tau value 10s which is equal to the period of the noise and 20s which is an integer multiple of the noise's period. In the second plot we can see the time domain shape of the noise (sine) and its period.